Save the Dates: February 17 – March 10, 2019! 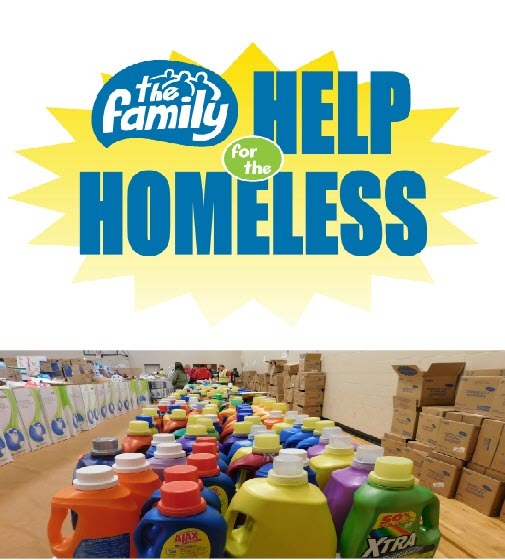 265 Fox Cities businesses, churches and schools participated in The Family Radio Network’s annual “Help for the Homeless” (H4H) hygiene drive in spring 2018 – donating $168,000 worth of hygiene supplies for 18 local crisis agencies – COTS, Inc. was one of them. Thank you! Your involvement helps conserve our limited financial resources and is tangible proof to those we serve that they have worth and the community does care about them. Please look for the familiar H4H boxes at your workplace or when you shop at area businesses from Sunday, February 17, through Sunday, March 10, 2019, and consider placing a few items inside. Small kindnesses help bring about great things to COTS and all the other organizations supported by the H4H hygiene drive! COTS residents and staff are GRATEFUL for all who helped us share the spirit of the season at the end of 2018, as well as those who supported the COTS spirit of service throughout the year. Without meal ministers, donations of time and talent by a multitude of service providers, corporation and foundation grants, and monetary and basic needs gift donations, we could never achieve so much! Our work at COTS focuses on 4 areas key to leaving homelessness for good: stable housing, employment/education, pro-social connections, and well-being (physical, dental, and behavioral health). COTS creates a positive placement plan for each resident with the 4 areas outlined. 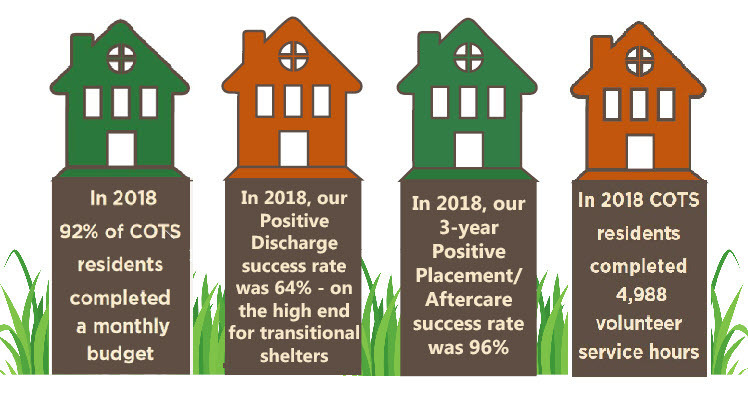 Our connections with Partnership Community Health Center (PCHC), Riverview Gardens (RVG), and other agencies allows people to move forward with ongoing success plans. Positive outcomes like those shown above result from combining the 4 key areas with the dedication and hard work of staff, volunteers, collaborative efforts with other agencies in the Fox Valley and YOU. Your help and support empowers all of us to move forward and continue with our vision to end homelessness by enabling individuals to transition to self-sufficiency and independent living.